Walk into the local health food shop and you'll see adverts for acupuncture and herbal medicine, hypnotists and homeopaths. But what exactly is 'alternative' medicine? Is the astonishing popularity of alternative and multicultural medicine really such a recent development? And, given the success story of modern biomedical science, why are alternative and traditional treatments now so fashionable? 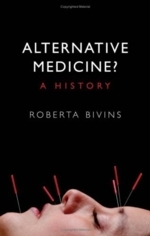 Bivins unearths the roots of today's distinctions between alternative, complementary, and orthodox medicine, and shows how interest in medical alternatives – often of exotic origin – is a phenomenon with a long and fascinating pedigree. `A brilliant foil to the privileging of Western medicine, this is cross-cultural history at its best - lively, acute, richly informative, and wonderfully revealing. ' Roger Cooter, Wellcome Trust Centre for the History of Medicine, University College London. Roberta Bivins is Wellcome Lecturer in the History of Medicine at Cardiff University. Born in Massachusetts, she spent much of her childhood in Nigeria and has first-hand experience with non-orthodox medical practice in the Third World.